Additive manufacturing has come a long way in past few years, including recent advances in metal 3D printing. Given the penchant for firearms in the United States, it's of little surprise to see the advent of the first functional 3D-printed metal silencer. 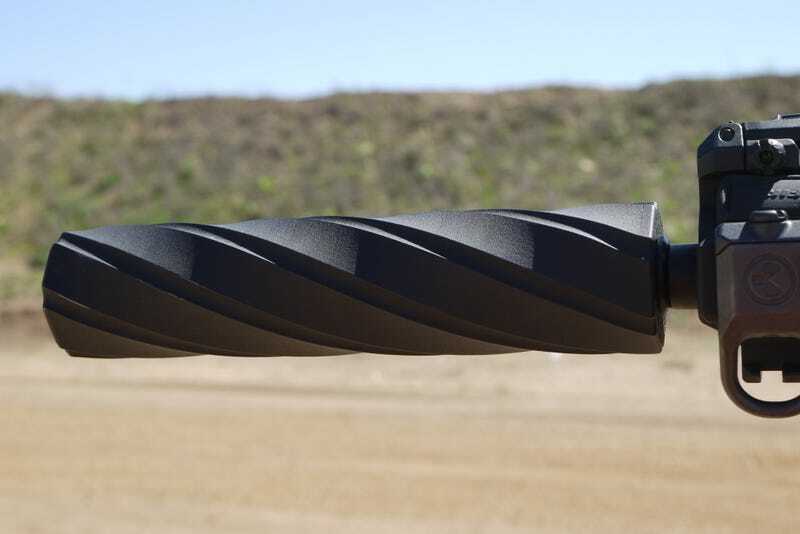 A gun silencer, or what is more accurately called a "suppressor," is a way to reduce the sound of a shot being fired. These accessories work by reducing the speed, volume, and temperature of the rapidly expanding gases. But unlike the way they're portrayed in movies, silencers are actually meant to protect the hearing of the user; they dull the sound rather than masking it altogether. At any rate, silencers are an important component to guns. Hence the introduction of the world's first metal 3D printed silencer, an advance made possible by techniques like Selective Laser Sintering (SLS) where it's possible to build objects without support structures or complex moulds. Recently, firearm blog TheTruthAboutGuns was allowed to test the new device. The company that made the silencer asked not to be named because it's a parts manufacturer that has no intention of being in the firearms businesses (so it says); it was simply a way to show off its printing technology. The best part is, out on the range, it actually works. Running the can side-by-side with a Liberty Mystic-X, the 3D printed model is slightly louder but still well within the realm of “hearing safe” with subsonic 300 AAC Blackout ammunition. With a little tweaking that could probably be improved, and given the efficiencies of 3D printing, that shouldn’t take too long. The only real concern I had with the can is durability. A circumferentially welded titanium can will stand up to an insane level of stress before it finally bursts or wears out. But with a 3D printed suppressor I have no idea about how short the barrel can be on a rifle or how many rounds it can go before it starts to fail. If this were to be commercially available, I’d want to see some serious testing before I bought one, and even then I might hold off for a couple years to see how things went. Clearly, this is a sign of things to come. But given the recent introduction of a fully operational 3D-printed handgun, the dark side of this technology is coming more clearly into focus. Photographs: Nick Leghorn/The Truth About Guns.